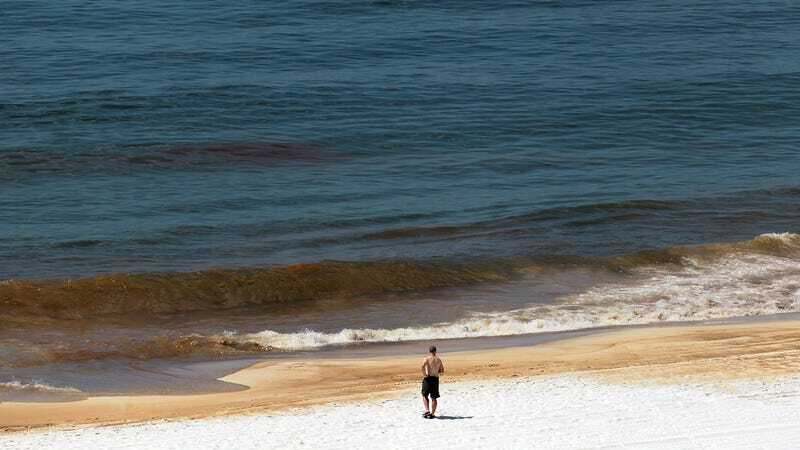 The Alabama coast during the 2010 Deepwater Horizon spill. Image via Getty. The plan would allow drilling in nearly all U.S. waters, from the Arctic to the Pacific Ocean and throughout the Eastern Seaboard. Meanwhile, the severe impacts of the Deepwater Horizon disaster in 2010 are still being felt—a significant die-off of whales and dolphins in the area continues today, cleanup workers have reported adverse health effects, thousands of fishery jobs were lost—although evidently not by the Trump administration, whose only instinct regarding the environment is to urinate on any piece of wilderness protected by the previous administration. On Thursday, the Interior Department suspended a study conducted by the National Academies of Science, Engineering and Medicine on the safety of offshore oil and gas drilling platforms. While Zinke’s pals in the oil and gas industry have expressed their gratitude, others—including Florida governor and Trump ally Rick Scott—are less pleased. “I have asked to immediately meet with Secretary Zinke to discuss the concerns I have with this plan and the crucial need to remove Florida from consideration,” Scott said in a statement. Other less environmentally-inclined figures are opposed to the plan, as well: Florida Sen. Marco Rubio also says he plans to ask Zinke “to recognize the Florida Congressional delegation’s bipartisan efforts to maintain and extend the moratorium in the Eastern Gulf of Mexico, and remove this area for future planning purposes,” The Hill reports. Maryland’s Republican governor Larry Hogan, South Carolina Gov. Henry McMaster (R), and outgoing New Jersey Gov. Chris Christie (R) are all also opposed to oil and gas drilling on their coastlines. “Today’s announcement by the Trump administration willfully ignores coastal governors, communities, businesses, and elected leaders up and down the coast who’ve made it clear they don’t want drilling off their shores,” Southern Environmental Law Center Senior Attorney Sierra Weaver said in an emailed statement.